What are the Common Conveyor Types in Aggregate Production and Mineral Processing Operations? As mentioned above, numerous conveyor types may be added to a system. Our previous “Conveyor Systems 101” post here on the blog gives some insight into possible applications for the most common conveyor types found in aggregate production, mineral processing, and more—radial stackers, overland conveyors, transfer conveyors, telescopic conveyors, and conveyors for loading and unloading railcars and barges. These basic belt conveyor types have different uses and operate in specific ways as detailed below. If you need to create stockpiles of material, radial stackers can get the job done quickly. These conveyors elevate material on an incline and deposit it where you need to locate your stockpile. They typically can move between 200 to 1,200 tons of material per hour and can accommodate about 4 different belt widths and a variety of belt lengths. They can also pivot along a radius to create a kidney-shaped stockpile for maximum stacking capacity. True to their name, overland conveyors are utilized to move material over sometimes vast distances. They can be built to accommodate changes in landscape elevation with proper acceleration and deceleration over hills factored in. Standard widths range from 30-84 inches, and they can transport about 15,000 tons of material per hour at a maximum. Versatility is the name of the game with transfer conveyors, which work in conveyor systems to solve tricky changes in elevation, turns in the system’s path, or transitions between other conveyor types. They are especially good for handling material that is not flat on the bottom. These conveyors are built to be portable and are popular in the construction industry, which requires frequently moving equipment from site to site. They’re also great for loading and unloading applications. Telescopic conveyors are made from several strong steel sections built into each other and stored in the base section when not in use. Conveyors for use with railcars may involve both belts and pressure or vacuum systems that promote constant material flow at high speeds. Because railcars are smaller than barges, these systems are more compact that barge loading and unloading conveyor systems, which typically feature standard belt widths of 24-60 inches. For loading and unloading both railcars and barges, overland conveyors and radial stackers may be used together as part of a complex system. Do You Need Multiple Conveyors in Your System? It’s true that conveyor systems often incorporate several different types of conveyors to achieve project goals and solve difficult site problems. For example, if you do need to work that 90-degree angle turn into the conveyors’ course that we mentioned previously, transfer conveyors can be incorporated into systems that also include overland conveyors to achieve some space savings. Likewise, some systems require multiple units of the same type of conveyor to best meet your needs. You may see radial stackers working in tandem, for instance, to create stockpiles of different product sizes. The earliest conveyor belts were made from leather (and hand-operated, no less), but innovations in materials over the centuries have provided countless industries with a wide range of belt material options. Rubber is often found on the covers of industrial conveyor belts, and they can be reinforced with “carcasses” made of materials like cotton, polyester, and nylon. Belts need to be flexible, of course, but they also need to resist ripping, extensive stretching, and impact damage, so multiple materials are employed to create the most durable belts. While there are also pneumatic and screw conveyors, the most widely used in quarrying, mining, and mineral processing are belt conveyors, which is what we’ve been focusing on here. They are so popular because they are the most versatile. Belt conveyors are also affordable to customize and maintain with replacement components and parts. The size/shape and status of the material to be moved (wet, sharp, sticky, etc. ), as well as loading conditions, are just some of the many considerations that must be made to determine what conveyor system will be right for your production requirements. Conveyor systems can be stationary, though portable units like telescopic conveyors have been growing in popularity in recent years, and if your business depends on completing projects at various sites, owning mobile conveyor equipment may make good financial sense. Additionally, some, though not all, conveyors are reversing and can run in either a forward or backward direction. Thoroughly understanding the capabilities of each conveyor type is key to devising the best system, though it is equally important to know your project. You may have identified the need for a conveyor system in getting set up for a new material handling project, but there are many additional goals and requirements to consider before the conveyor purchasing process can begin. 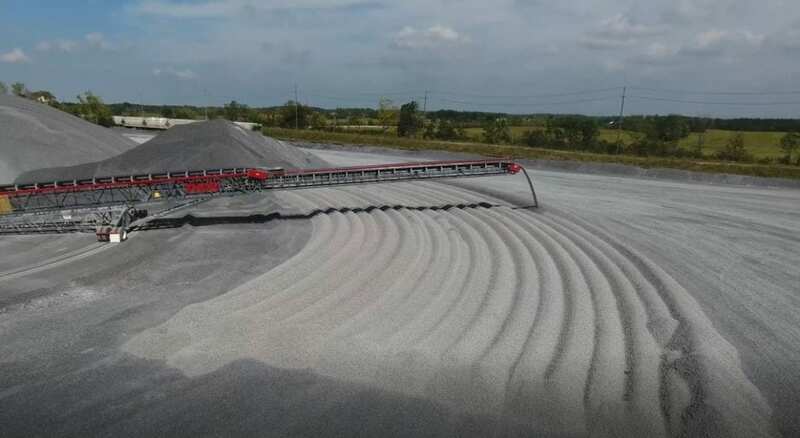 Whether it’s a fine grain substance like sand or a large, raw rock material coming straight from the quarry pit on its way to a primary crushing station, a material’s size and type directly affect how fast it can be moved (with larger, heavier material typically moving at much slower speeds than light, small material). The temperature, physical attributes, and weight per cubic foot of the material must also be taken into account to pinpoint accurate conveyor requirements. Specific factors about your project site are of utmost concern, as well. The length and lift of your conveyor system will be determined here, though loading conditions at both the starting and ending points must be thought through, too. Will your conveyor system require a 90-degree turn at some point along the line? 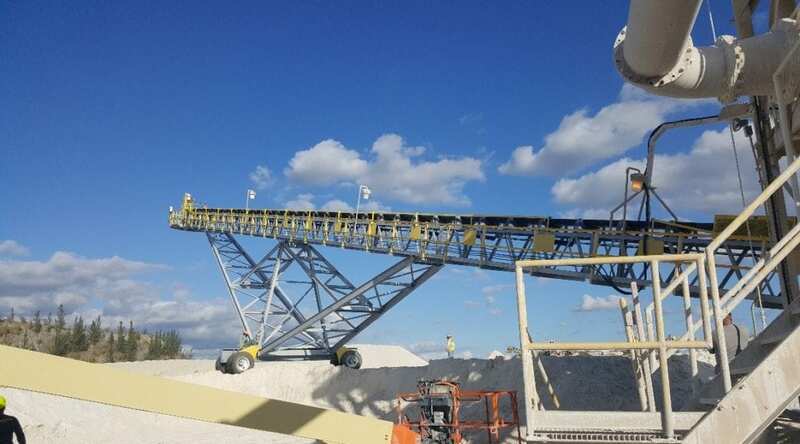 Are you utilizing the conveyor primarily for loading onto a railcar or barge for shipping, or are you looking to create stockpiles of material on your own site? Lastly, at what speed do you need to move your material? Conveyor belt widths are directly tied to how many tons need to be moved per hour, with wider belts accommodating faster speeds. Horsepower will also vary based on the speeds your operations require, as well as the type of material you’re transporting, of course. Feeling stuck in the planning phase? Solving complex problems with your site and loading conditions, or perhaps optimizing an existing operation can be difficult to accomplish with just your internal team, and many clients come to us here at Kemper Equipment as they’re working through planning-related questions. We love to consult and work as a partner at this stage with our clients! Designing and manufacturing our own conveyor systems and radial stackers in house gives us an advantage over competitors. But, whether you choose to work with another firm or us, we strongly suggest that you seek engineering and process design expertise to achieve the best efficiency and profitability outcomes for your project. As we’ve demonstrated, there is a long list of considerations to be made when implementing conveyor systems. It should be clear by now that customization is your very best option to make your material handling projects with conveyors successful. Here at Kemper Equipment, our advanced capabilities in designing and engineering these custom conveyor solutions allow us to solve problems without compromises and eliminate the need to create costly (or just plain annoying) “workarounds” in processes. Contact us today to start the conversation about your latest project goals and requirements. From design to installation, as well as strong support to help you reach your production goals and keep within budget, Kemper Equipment is ready to supply the conveyor systems you need.